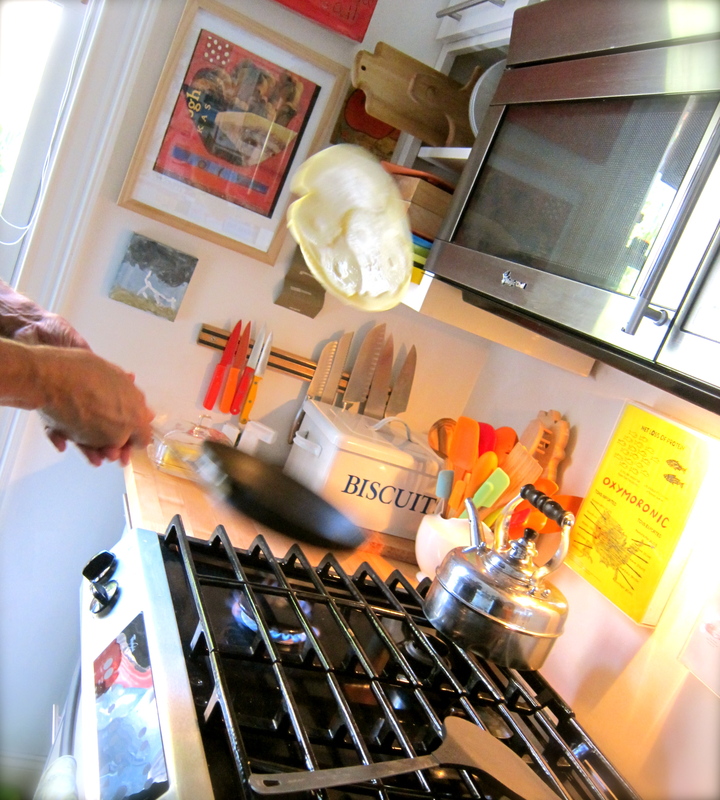 Yes, your eyes are not deceiving you…high above the skillet, looking very “halo-like” over one of my Charlie Cook tough-guy paintings, suspended for a split second mid-air, is one of Wouter’s Sunday morning Dutch Pancakes. It landed back in the skillet effortlessly and for a moment upon entering the room I wondered if I had stumbled in on some performance art piece, or breakfast? 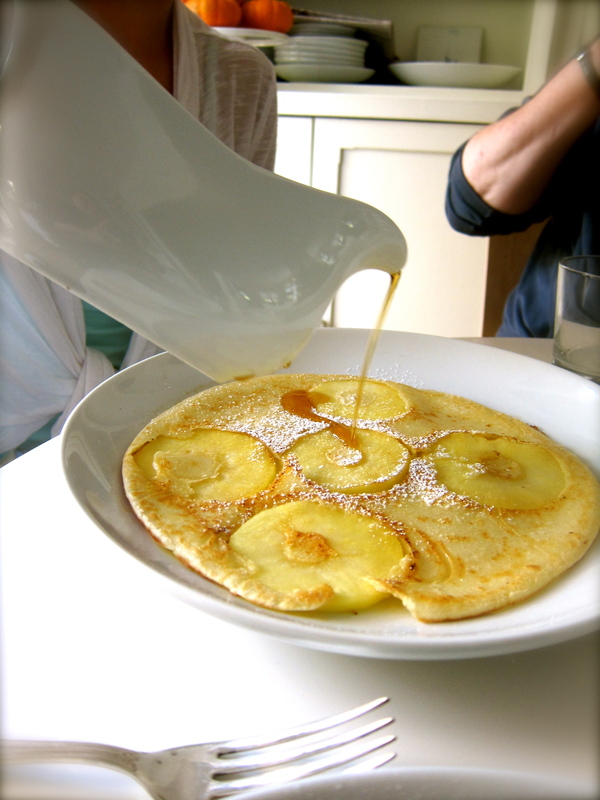 Pannekoeken or Dutch Pancakes are one of our favorite breakfasts. 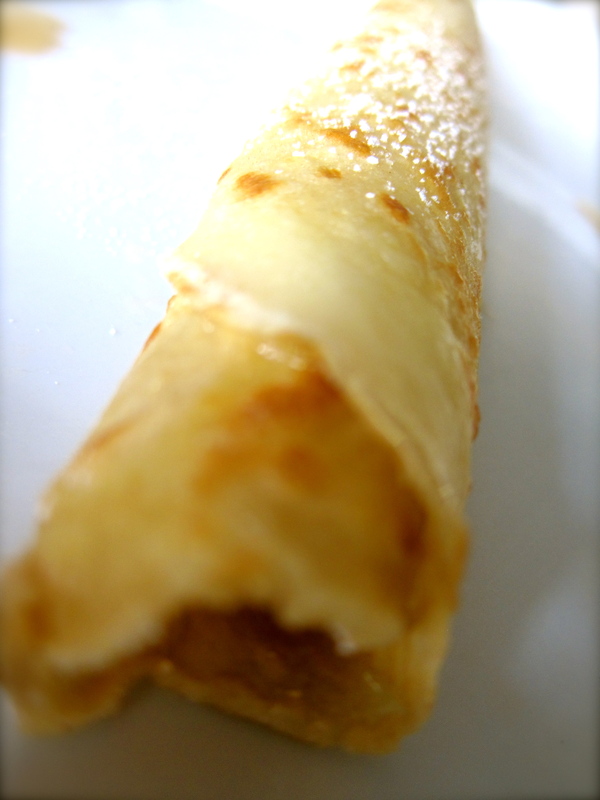 Unlike our American pancakes these are a bit like a cross between a pancake and a crepe, can be rolled or eaten flat with powdered sugar and/or maple syrup and can have apples or other fruit added as well as bacon. 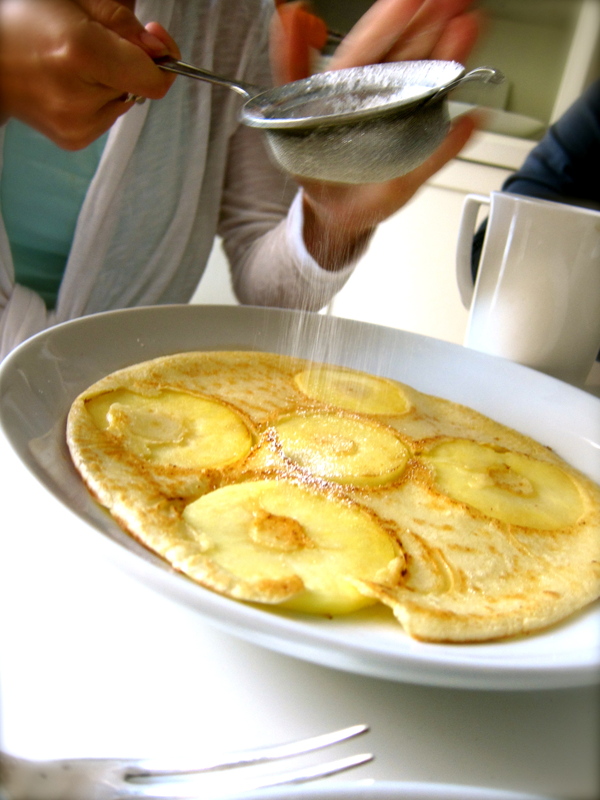 In The Netherlands we always have at least one breakfast, or dinner of Pannekoeken. It is one of the culinary joys of visiting. I don’t ask for them often as I understand what makes “something special”, special. 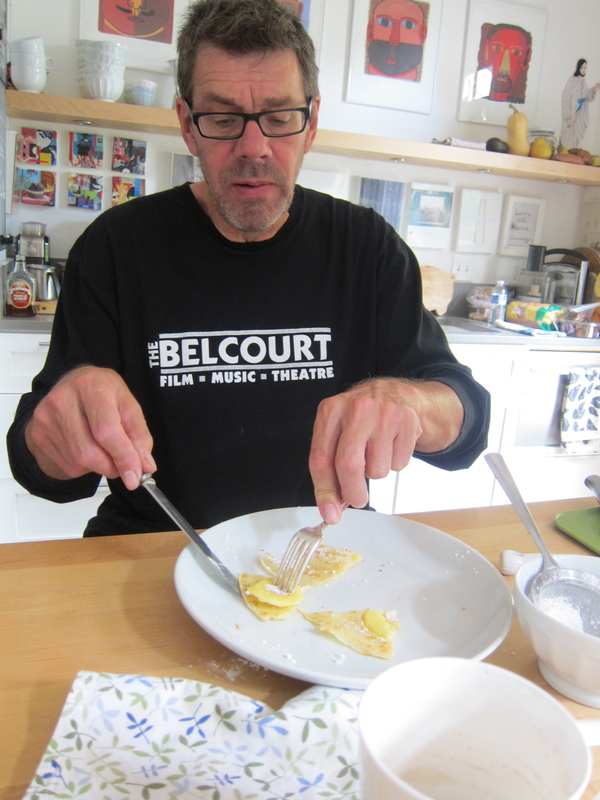 But with food friends Nancy Davidson & Diane Stopford as guests I asked Wouter to make this very special breakfast for us…..Pannekoeken, please. 1 cup unbleached, all-purpose flour; 2 large eggs & 1/2 cup milk. 1/2 stick butter for the skillet. Powdered sugar & real maple syrup. Tart seasonal apples such as Braeburns; Pink Ladies; Jona Golds, Granny Smiths, cored, peeled and thinly sliced. 1. 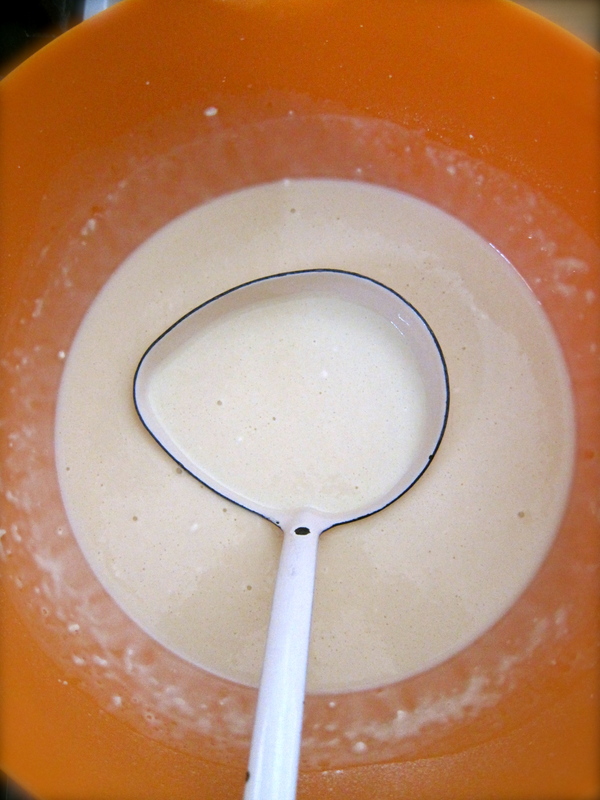 Mix together in a bowl the flour, eggs & milk using a whisk. Let batter stand about 10 minutes. 2. Using a 10 inch non-stick skillet over medium high heat Wouter has melted some butter. When skillet is hot and butter is sizzling he ladles a thin layer of batter, turning pan from side to side to coat bottom of pan with batter. Return pan to heat. 3. 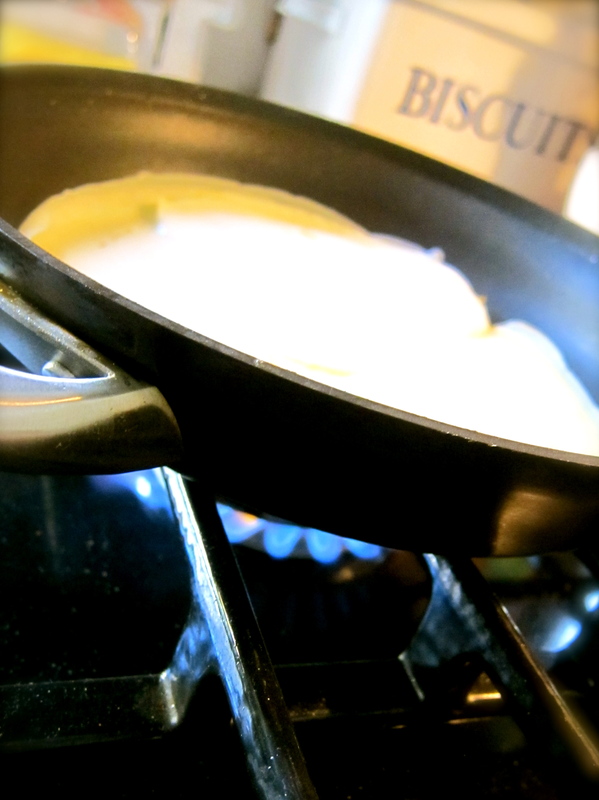 When the batter starts to pull away from sides of pan and starts to set around the edges, tilt the pan around so batter can run underneath cooked edges. Do this during the cooking time so batter will cook evenly. It is now time to flip the pancake. You can do this the more conventional way using a spatula or if feeling a bit of theatrics coming on, just flip mid-air like Wouter does! 4. Flip. These are pancakes best served as they are cooked so Diane, Nancy & I waited patiently with our lattes for our first Pannekoeken hot off the grill. 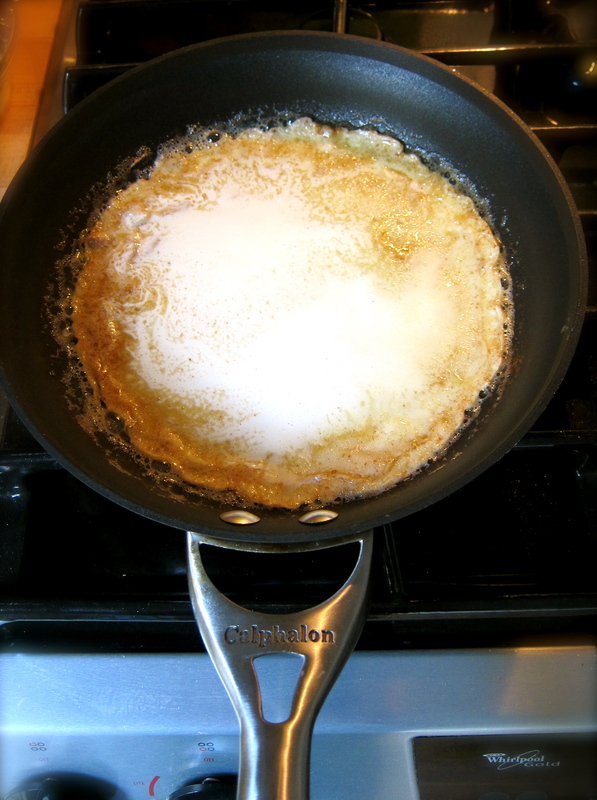 First we add powdered sugar…..
…some warm Wisconsin maple syrup…. …rolled & ready to eat. For Pannekoeken round #2 Wouter poured the same batter over apple slices. 1. 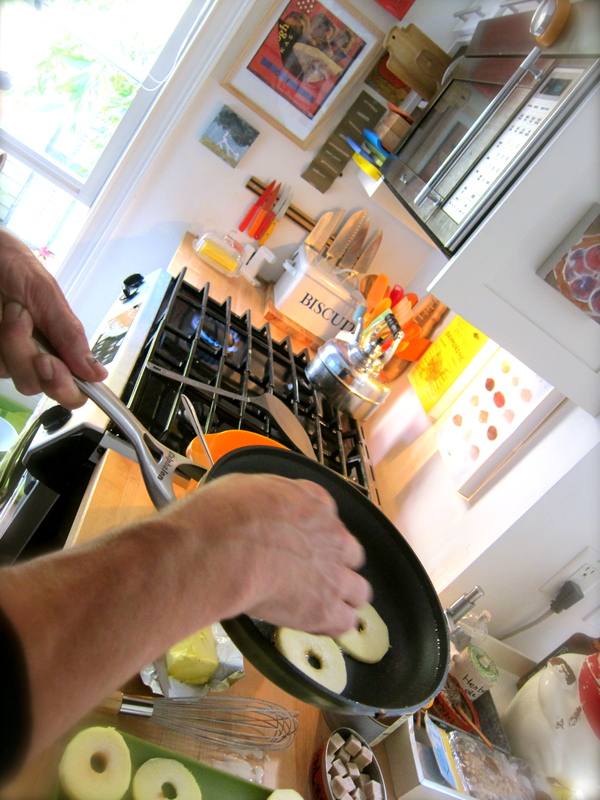 Wouter arranges apple slices over bottom of skillet with hot melted butter. 2. 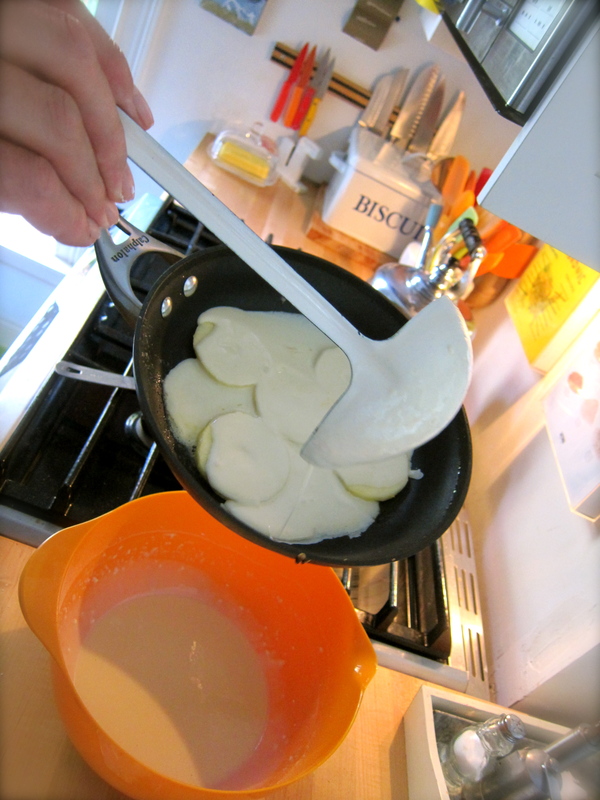 Ladles a thin layer of batter over apples & returns skillet to heat. 3. 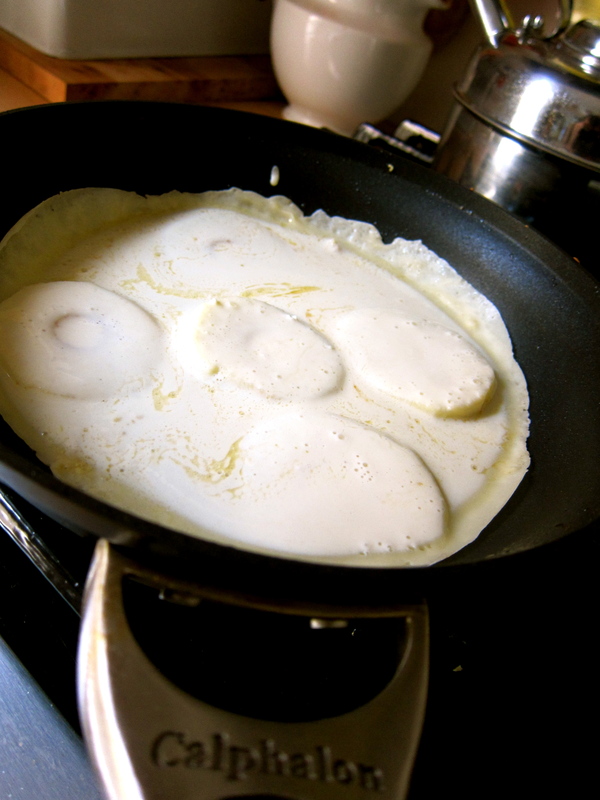 Cook until edges of pancake are set and middle is bubbly, tilting and turning pan to let uncooked batter seep underneath edges to bottom of pan to cook. 4. Flip. Cook on other side and serve hot! 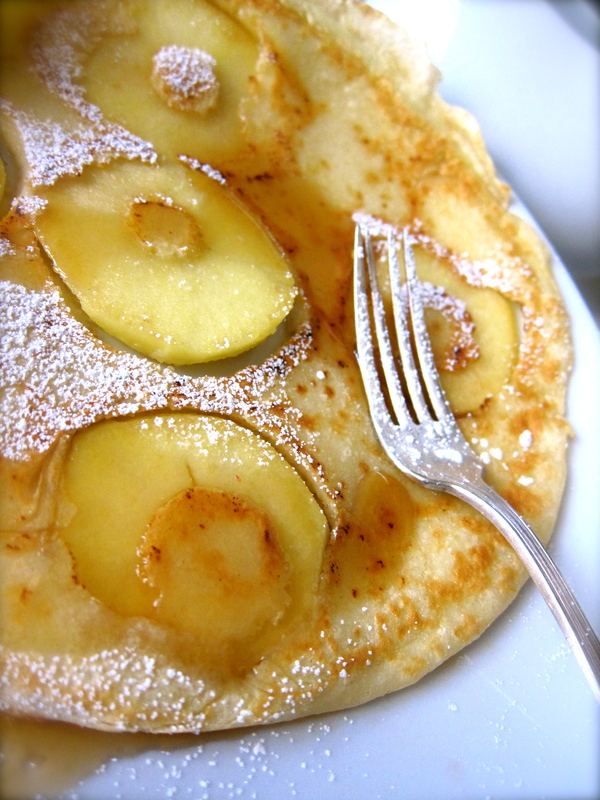 The apples are fork tender, the pancake hot with warm syrup & a dusting of powdered sugar. Pannekoeken Perfect! 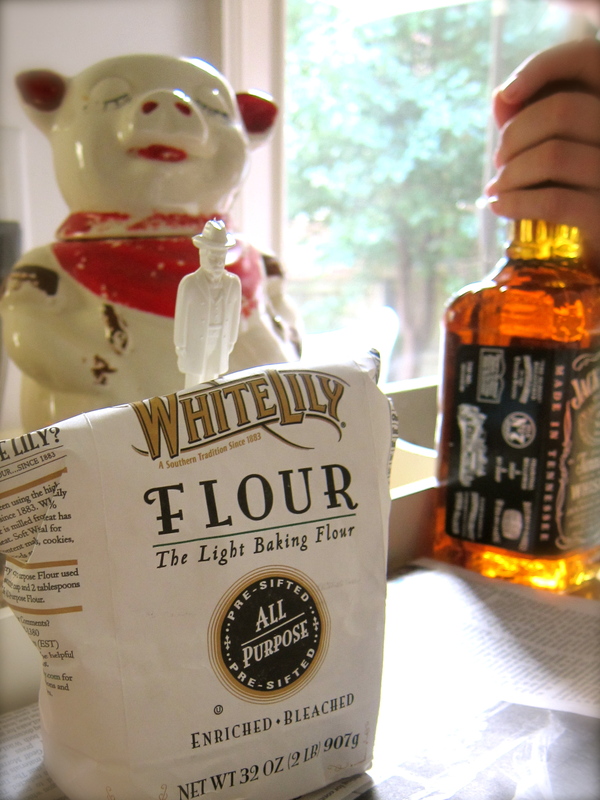 We like White Lily flour for Pannekoeken. Finally, the cook gets to eat! Another great post Teresa. Leave it to Wouter to make breakfast a carnival! I know Mark, he makes everything a carnival! Even breakfast. You may tell Wouter I said so! Picky eater that I was, a plate of pannekoeken dusted with confectioners was one of the first things that I really liked when I went to live with my Dutch family a million years ago. 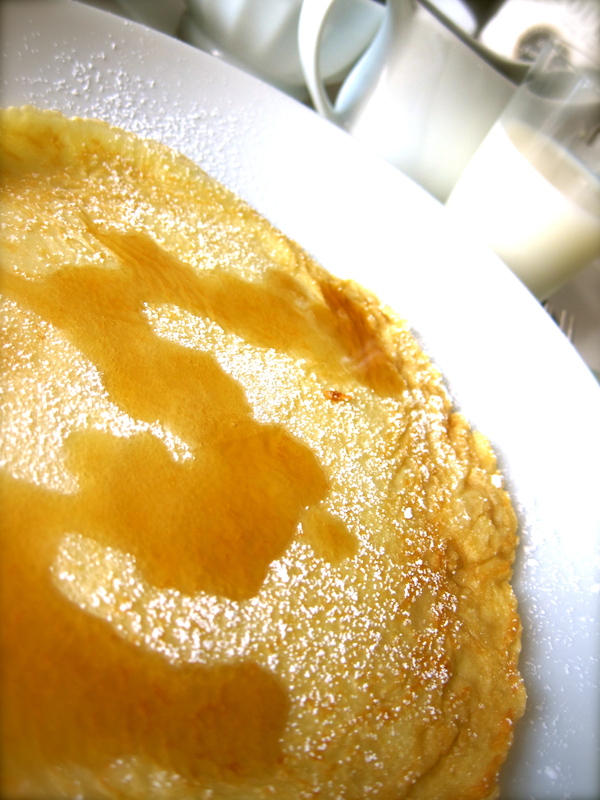 Also there was a thick syrup, Stroop, that some liked to spread (with difficulty–very thick) on their giant pancake. Lekker. Wow Wouter! 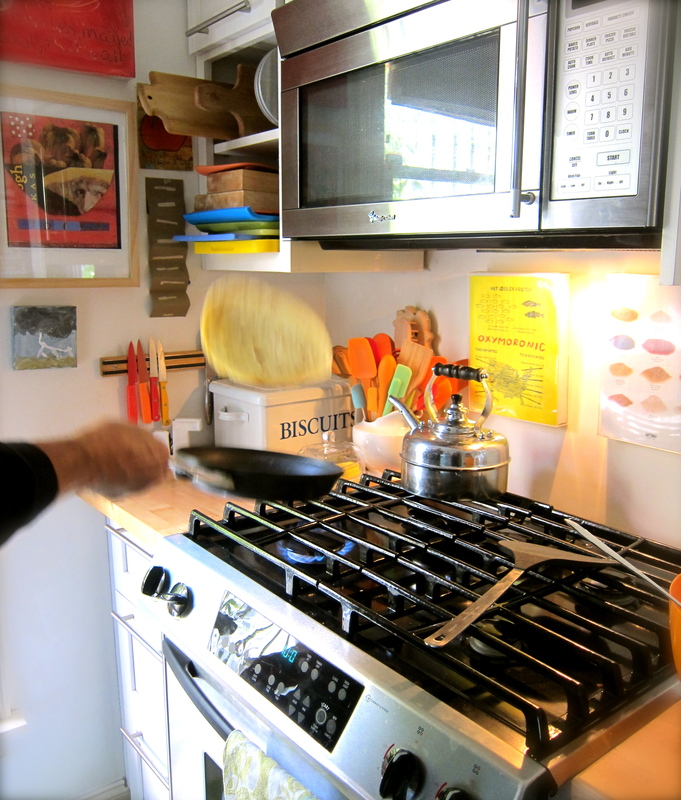 I was there and I didn’t even realize he flipped the pancake so high. Love being part of your blog. The pictures are superb as usual. 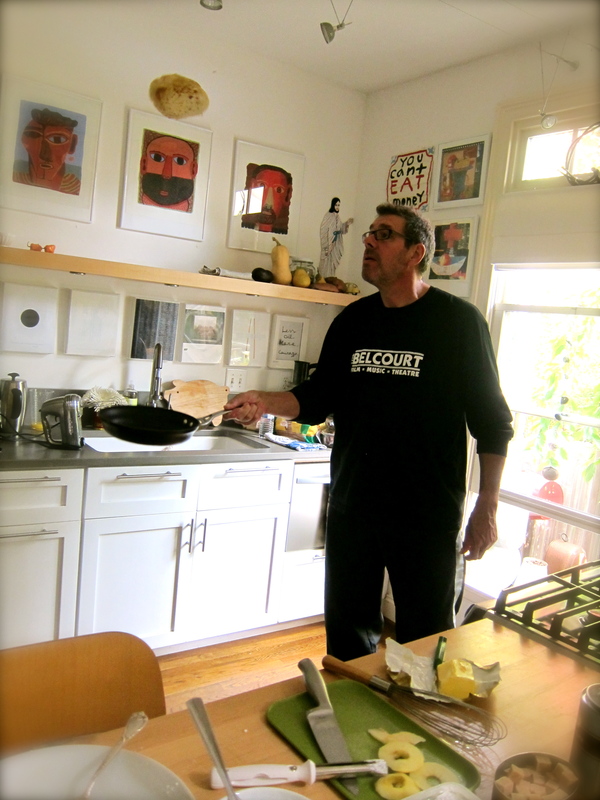 And the pancakes — the best in the world. Thanks again for a magic weekend. that WouWou he’s a real entertainer with his crazy Dutch moves. My mother want to have pancakes tomorrow morning, thank you very much, just kidding, but we have to go to the pancake house. Het water liep in haar mond. 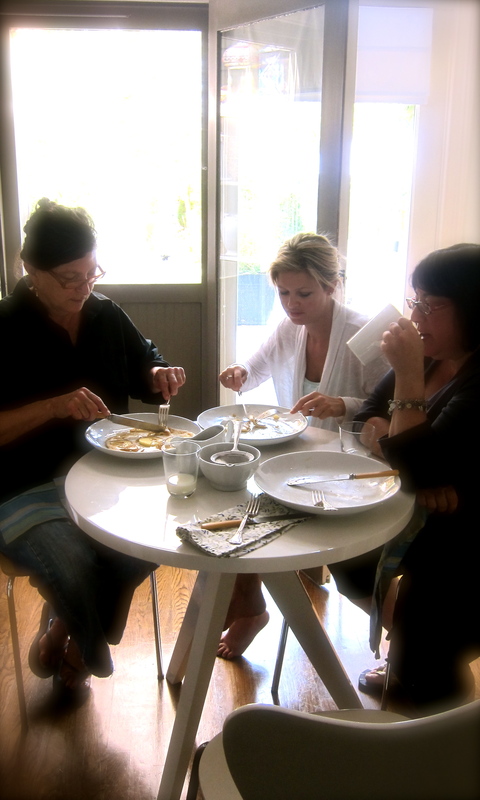 Ohh the memories of Wowter’s pancakes and a fun stay on 5th Ave, Teresa you are a lucky lady! 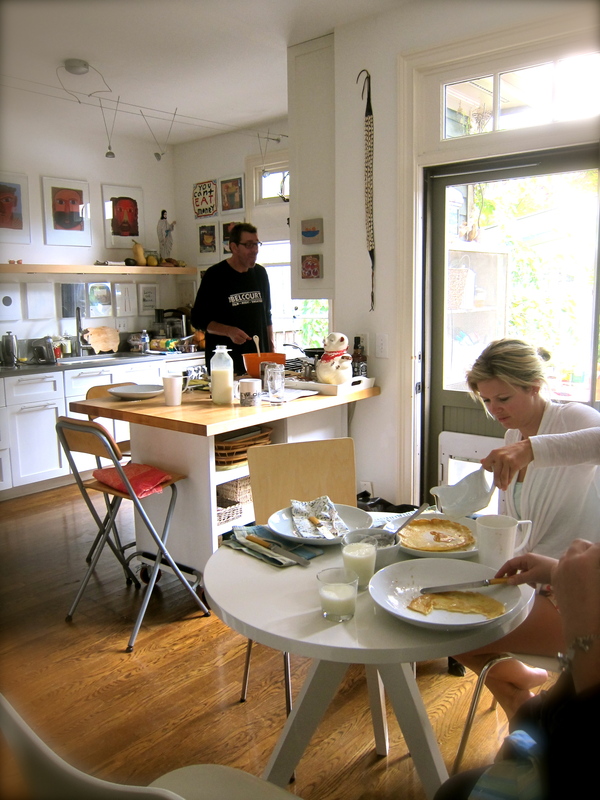 Wowter please come to NY to make Nancy and I pancakes again! 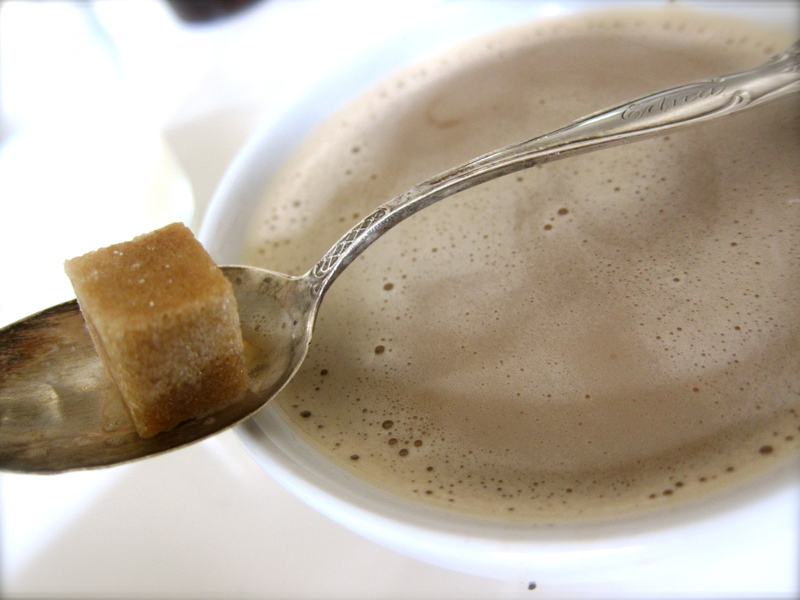 Perfect for a cold morning! 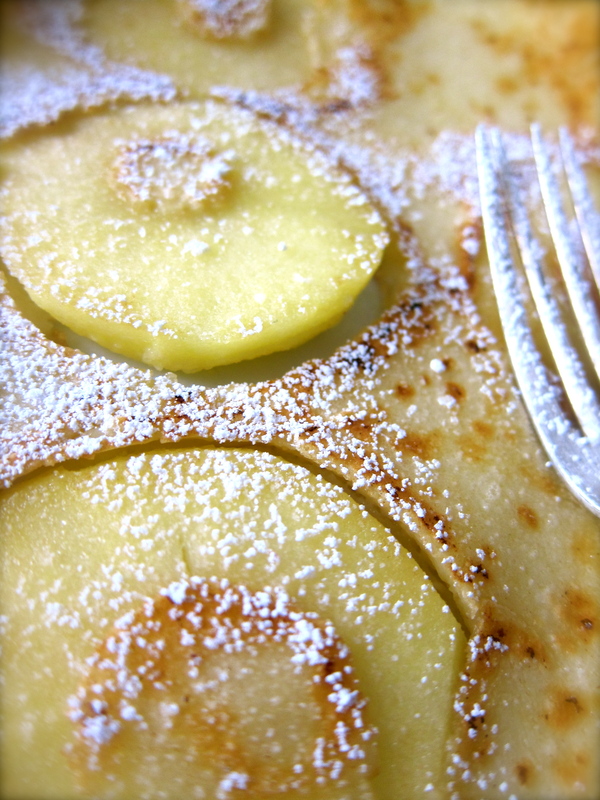 The apple Pannekoeken looks delish! My mother want to have pannekoeken, so on the road to Bergen, there is a old fashioned pannekoeken huis (dutch pancake house). Oh I wish I was going to Bergen with you for Pannekoeken. johan is almost as good as his brother with the flipping!!! Barbara, Just got an email from Wouter and he said that they did not go to Bergen…he was just teasing me! I could already taste those lovely pannekoeken with bacon! Hope are well and thank you so much for commenting on my blog. Fab photos, make me want to eat it now! 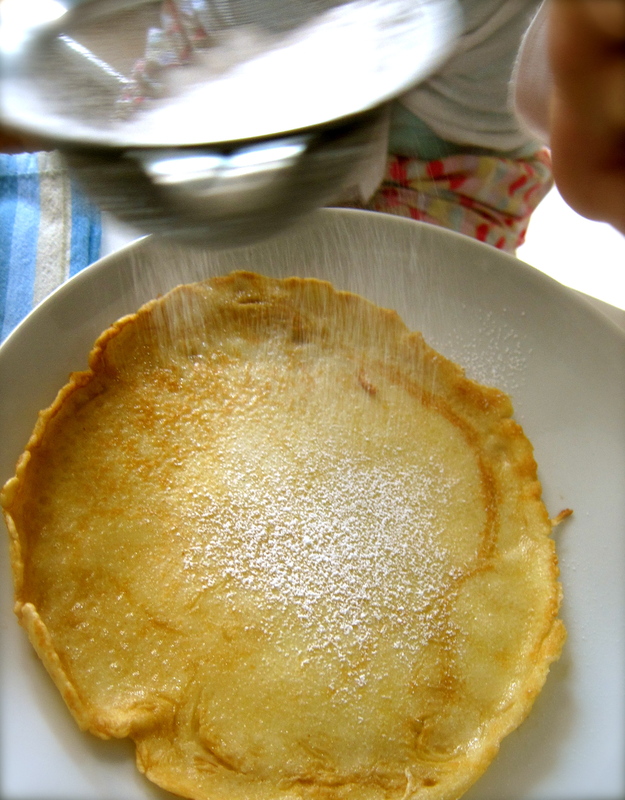 My dad and I made a batter very similar to this growing up; he called them “Norwegian pancakes.” We used to drizzle fresh lemon juice and a smidge of regular sugar on top and it was divine! But this apple-y version looks great, too, especially considering the season. Charlotte, thank you for the comment. I have had the version you are talking about. A friend of my makes a “dutch baby” pancake that is similar except you put it in the oven and it will puff up. 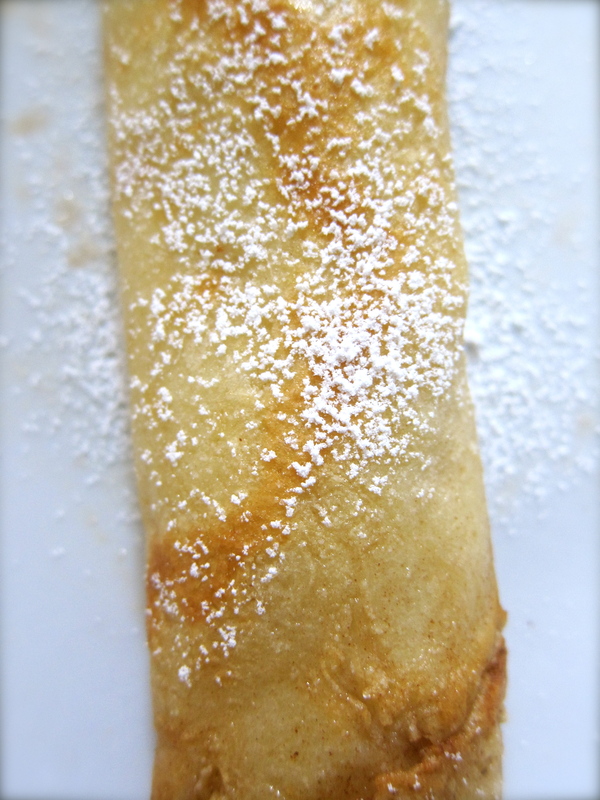 She then drizzles it with fresh lemon juice and a dusting of granulated or powdered sugar. Delicious, all of them. I will check out your blog as well. I love it when people like you find me out here in the world of food blogging. Thanks and keep checking back for a new posting weekly. Bon Apetit. 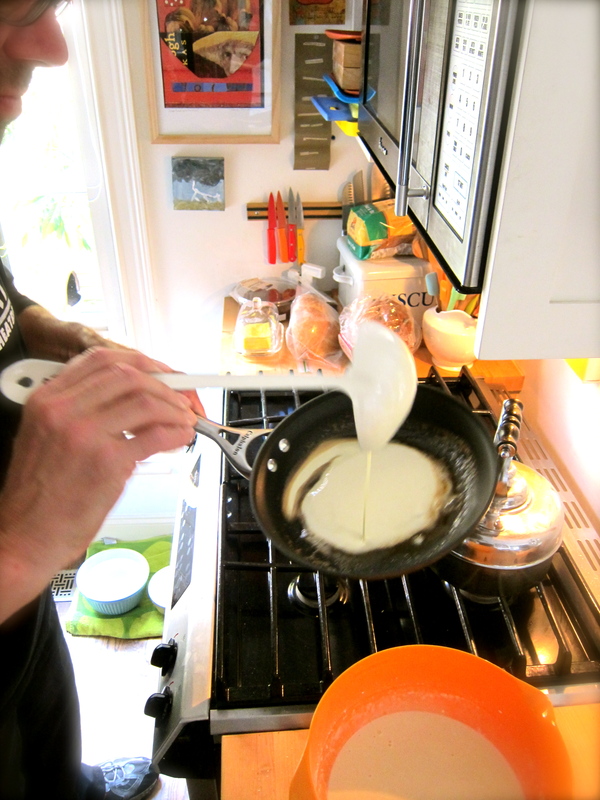 Wow, those look great…..I wish Wouter would make me a Pannekoeken. What does one have to do to deserve a Pannekoeken? Please advise. By the way, those are beautiful hands. Just ask. That is how it works. He loves to make them and so far everyone who has enjoyed this lovely breakfast has “just asked”. Try it at the end of the week when those beautiful hands return from Amsterdam! Jane, thank you so much for letting me know and for featuring my “Pannekoeken” post. Best to you and to the exciting new FoodPress.com. Teresa B. Yummy!!! Looks delicious 🙂 miss you and wouter!! FANTASTIC! Reminds me of crêpes! YUM.. I’ll have to try this recipe! This post is entertaining, its like watching a TV show. How ddi you manage to flip that really high! Anyways the pannekoeken looks delicious. Raymund, Wouter has many talents and flipping pannekoeken is just one of them. Thanks & it is always delicious. I have visited Den Hague with my beloved Wouter, but on the next trip will definitely have Pannekoeken at Kijkduin. Thanks. Darn you. I just had breakfast and now I’m hungry again. What’s for lunch?